For a few years now, a joint team of Iranian and US scientists has been actively participating in a global campaign against the Middle East Peace Pipe (MEPP). The initiative is presently being led from the Tisch Cancer Institute and Institute for Transitional Epidemiology (Mount Sinai School of Medicine, New York) under the guidance of world renowned antismoking activist Paolo Boffetta, whose name has also been associated for a long time with the International Agency for Research on Cancer (IARC) in Lyon (France). Their last collective study reads: “Determinants of gastroesophageal reflux disease, including hookah smoking and opium use- a cross-sectional analysis of 50,000 individuals” . What is striking from the outset is how, through such publications, the MEPP is targeted in a vain attempt to “demonstrate” the association of the latter with all sorts of diseases, particularly cancer. Not only are the advertised figures for such a so-called risk quite low but the emphasis put on it is quite amazing as well as suspect. This said, the readers’ attention should be drawn to the fact that Boffetta, as a world renowned epidemiologist, had issued in 2008 a “Plea for epistemological modesty” (sic), stressing that there was a “tendency of authors and journal reviewers and editors to report and publish “positive” or “statistically significant” results over “null” or “non –statistically significant” results, particularly if the findings appear to confirm a previously reported association (ie, the “bandwagon effect”)”. As with other forms of bias, preferential publication generates a false sense of consistency among studies” . However, such a “plea” proved to me mere hypocrisy after he and his Indian and Iranian colleagues subsequently published in the British Journal of Cancer a false-positive result in a straightforwardly anti-MEPP zealous paper . The critique of the numerous serious errors (incl. a blatant false-positive finding related to poor hygiene) to be found in the latter confirmed the popular “c’est l’arroseur arrosé” French joke (Now the boot is on the other foot…). In only 1000 words, the critique exposed, by the same token, one full decade of pseudoscientific claims and unethical methods regarding the so-called toxicity of hookah/shisha/narghile smoking” . Now, in their last study , the obsession about a particular risk factor (the MEPP), as if it were a central one and in spite of the low figures, remains suspect for many reasons. 1-Once again, what the author of the plea for “epistemological modesty” has measured among Iranian patients (with the implicit unscientific intentions to generalise findings to all users of the MEPP across the world) is certainly not the effect of water-filtered tobacco smoke but the lack of physical activity. Why? Unlike cigarettes, solid studies have shown that there may be some relation between high body mass index/obesity and hookah smoking because it is well known (except for naïve positivist reductionist researchers deserving more the name of “arithmeticians” than “epidemiologists”) that many users of the MEPP, in the Middle East region in particular, generally spend hours chatting over a hookah, particularly after meals. 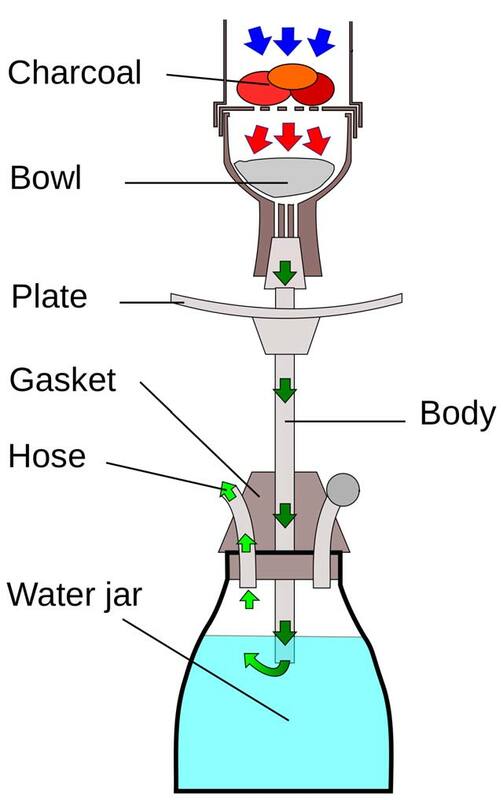 2-As evidence of the above-mentioned hookah-obsession, the reader is invited to consider how the authors have inserted an image supposed to show what an Iranian water-filtered tobacco smoking pipe is. Then, what is surprising from people supposed to do science is that what they have actually represented is a shisha pipe used for flavoured tobacco molasses smoking mixtures, not the MEPP used among their populations in Iran (most of them smoke plain tobacco). 3-Concerning the very same image (sources as “Wikipedia”), the antismoking researchers reveal that their working methods are very similar to those of many lazy young students who rush to this so-called “encyclopaedia” for their dissertations, as if it were a trustful scientific source… In fact, all critical observers know by experience that such an online resource actually reflects conflicts of interest between its so-called “editors” and “administrators” and nothing more; particularly when it comes to such sensitive issues as tobacco, drugs, Middle East, etc.. In other popular words, Wikipedia is not Gospel Truth. It is just a politicised hotchpotch of selected pieces of information and nothing else. What is more surprising is that the trend to cite such a thing as Wikipedia is common in the antismoking so-called “peer-reviewed” literature. Before Paolo Boffetta and his colleagues, international “experts” from the World Health Organisation (WHO) did also resort to it. They even went so far as quoting extensively from that “”encyclopaedia”” . By that time, we immediately wrote a Letter to the Director of that organisation . In view of such totalitarian pseudoscience campaigns, the only reasonable response should be to bring these people altogether to an international court and make them accountable for the public money they have wasted for personal motives (“CV boosting”) and global corporate ones (Prohibition agenda) . When will they leave Asian and African peoples in peace? Isn’t it a pseudoscientific-evidence based war of the richer (with the help of the unavoidable local “informants”) against the poorest? Does the world need new wars? Islami F, Nasseri-Moghaddam S, Pourshams A, Poustchi H, Semnani S, Kamangar F, Etemadi A, Merat S, Khoshnia M, Dawsey SM, Pharoah PD, Brennan P, Abnet CC, Boffetta P, Malekzadeh R. Determinants of gastroesophageal reflux disease, including hookah smoking and opium use- a cross-sectional analysis of 50,000 individuals. PLoS One. 2014 Feb 21;9(2):e89256. doi: 10.1371/journal.pone.0089256. eCollection 2014. Boffetta P, McLaughlin JK, La Vecchia C, Tarone RE, Lipworth L, Blot WJ. False-Positive Results in Cancer Epidemiology: A Plea for Epistemological Modesty. J Natl Cancer Inst 2008;100: 988–995. Chaouachi K. False positive result in study on hookah smoking and cancer in Kashmir: measuring risk of poor hygiene is not the same as measuring risk of inhaling water filtered tobacco smoke all over the world. Br J Cancer. 2013 Apr 2;108(6):1389-90. doi: 10.1038/bjc.2013.98. Epub 2013 Mar 7. WHO-EMRO (World Health Organisation – Eastern Mediterranean Regional Office) and ESPRI (Egyptian Smoking Prevention Research Institute)(2007). Shisha Hazards Profile “Tobacco Use in Shisha – Studies on Water-pipe Smoking in Egypt”. Cairo (14 March). ISBN: 978-92-9021-569-1. 84 pages. Prepared by Senior editors: Mostafa K. Mohamed, Christopher A. Loffredo, Ebenezer Israel et al. Contributors: Maged El Setouhy, Ghada Radwa, Rehab Abdel Rahman, Omar Kattan, Soheir Ayyad, Mohamed Hassan Hussein, Nargis Labib, Said Ohn, Aisha Abo El Fotouh. Letter to Dr Margaret Chan, Director-Gal of WHO (World Health Organisation), dated 18 April 2007, about the 2nd erroneous expert report published by her organisation. 18 April 2007. Maziak W. The global epidemic of waterpipe smoking. Addict Behav 2011; 36: 1–5. Chaouachi K. Human Health, ““Waterpipe”” (Hookah, Narghile, Shisha) Smoking and the Global Epidemic of Misrepresentations and Errors. SciTopics 2010 (10 Nov). Jacob P, III, Abu Raddaha AH, Dempsey D, Havel C, Peng M, et al. Nicotine, carbon monoxide, and carcinogen exposure after a single use of a water pipe. Cancer Epidemiol Biomarkers Prev 2011; 20: 2345–2353. Jacob P, III, Abu Raddaha AH, Dempsey D, Havel C, Peng M, et al. Comparison of nicotine and carcinogen exposure with water pipe and cigarette smoking. Cancer Epidemiol Biomarkers Prev 2013; 22: 765–772. McFadden M. Comment on: “Is “Kabat G. Is Thirdhand Tobacco Smoke” a Valid Scientific Concept or a Public Relations Gimmick? The Columbia University Press 2009 ( 9 Jan)”; 12 Jan 2009. Caldwell C. Comment on: “Is “Kabat G. Is Thirdhand Tobacco Smoke” a Valid Scientific Concept or a Public Relations Gimmick? The Columbia University Press 2009 ( 9 Jan)”; 14 Jan 2009. Chaouachi K. Prohibition Through the Hookah Looking Glass. Speech delivered at the second world conference of TICAP (The Tobacco International Coalition Against Prohibition). 15 Mar 2010. Nieuwspoort; The Hague, The Netherlands.